Clearly his name should appear in the dictionary under the heading of imagination. However, in all fairness, it is a collaboration of additional talent that should not go unnoticed. I speak specifically for names like Melissa Mathison who is no stranger to this genre of film making. As the screen writer for The BFG she also brings to the table her participation to iconic films such as E.T. the Extra-terrestrial (1982) and Twilight Zone the Movie (1983). Sadly these accolades are given posthumously, but her imagination lives on with The BFG. That Big Friendly Giant is Mark Rylance, making a successful transition from the dramatic thriller (Bridge of Spies-2015), to the voice of this unique resident of Giant Country. Unlike the others, BFG stands out among the other giants. Half their size, yet rising 24-feet tall, donning enormous ears and with a keen sense of smell, he is also delightfully dim-witted and introverted. On the other hand, the larger giants Bloodbottler, voiced by Bill Hader (Finding Dory) and Fleshlumpeater voiced by Jemaine Clement are twice as big, twice as intimidating and have been known to eat humans, in particular…children! 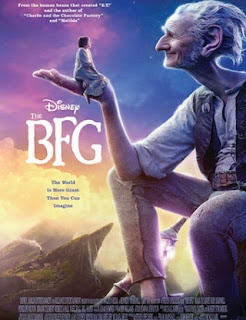 Frightened by her first encounter with BFG, 10-year-old Sophie (Ruby Barnhill) quickly realizes that this huge behemoth of a man is also big on being quite gentle and charming. This of course raises many questions. To answer, he brings her to Dream Country where he collects dreams and sends them to children, thus teaching her all about the magic and mystery of dreams. It is here that the real magic of this film begins. Ruby Barnhill is convincing and impressive in her film career debut, delivering a performance equal to seasoned actors. Adapted from British novelist Roald Dahl's 1982 novel, I highly anticipate box office receipts surpassing the $100 million to $125 million rumored budget to make the film. Since this was Steven Spielberg’s first time directing a Disney-branded movie, I believe it will not be his last.